Five ways to have yourself a very un-happy holiday | Yavitch & Palmer Co., L.P.A. Everyone knows drunk driving is bad; it’s a topic we beat to virtual cyber death. But after 20 years in the profession, the trends are obvious. The holiday season is full of spirits — booze that is — and the cops know it. They are out in droves, and for good reason. Have a few cups of cheer while shopping. Have a few at the office party. Have a few watching football games (even if the Bucks missed the playoffs). Have a few while decorating the tree. Have a few just ’cause you’re not working. But don’t get behind the wheel and crash your sleigh. The point is obvious: There are more drunks, partiers, and sleigh crashers on the road during the holiday season than any other time of year. So be careful, download Uber, call a cab, make your teenager drive you home (explain it in the morning). You may want a nice bracelet for Christmas, but handcuffs probably aren’t on the wish list. Holidays are full of family time. Nice long breaks from school and work. Maybe the kids are home from college. Maybe the house is full of those big personalities from out-of-town. Uncle Bob is here, and he likes his PBR. That can often be a recipe for domestic violence. Look, the holidays are stressful. Even though we may not be working, there’s lots to do and lots of people to see. And perhaps the Christmas bonus didn’t quite cover the kids’ gifts. The point is, don’t be the one who has to call us on Christmas Eve because you’re in cuffs on the way to jail. It’s too easy to blow a fuse and do something you’ll regret. Booze is the perfect fuel for that rage. And guess what? Courts will be closed. So if you find yourself sitting in a cell next to the town drunk, nestle in for a long winter’s rest. You’ll probably be there for awhile. So, maybe just have one beer, one cup of eggnog, or one cup of whatever holiday spirit you’re into. And when the stress hits, take a walk. Go get some air. Check out the neighborhood Christmas lights. Do something. But don’t take it out on your family or household member. Then thank yourself for not going to jail on Christmas. So maybe you’re not a full-blown shoplifter stashing scarves and watches in your pocket in the dressing room. But theft and shoplifting can be much more subtle. What about when the 15-year-old cashier forgets to ring up the second digital camera. You know it happened, but figure it was his mistake, not yours. Just walk out and get a windfall. Not quite. It’s still theft, even if it’s the cashier’s mistake. You knew it happened. You watched it happen. And you went with it. As soon as you intend to take it without paying, that can be considered theft under R.C. 2913.02. And if the property is worth enough ($7,500.00), it can be a felony. Remember, there’s no such thing as a free lunch. And letting the kid at the register screw up is not a free lunch. But it could land you a free ride to the store security room, where you will meet the local cops to help make your holidays unhappy. We’ve heard it before: New Year’s Eve is amateur night. Even those who don’t often drink are out drinking. So why does that matter (even if you’re a regular drinking pro)? It matters because every cop in the state is looking for amateurs and pros alike. Cops are more than happy to take down drunk drivers on New Year’s Eve. So they are looking — on the highways, outside bars and parties, and at sobriety checkpoints. They are there, looking to take down the drunk drivers. What better time to be off the roads and safe at home, or even someone else’s home? Or, just take a cab, Walk. Uber. Whatever. Just be safe and stay away from the driver’s seat of a car. The college kids are home for Christmas. The first thing they want to do is party with their old pals. Why not meet up at a bar, have some drinks, go dancing? Well (aside everything above), the drinking age in Ohio is still 21. That means that most kids in college are underage and can’t legally drink booze. 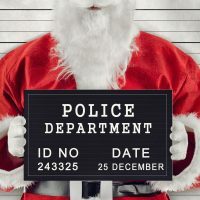 Even though they get away with it at their college dorms, apartments or even college bars, rest assured the police are looking extra hard at IDs during the holiday season. Remember, you really don’t look like your 21-year-old friend in that fake ID picture. And think how you might explain that to the cops when they check it. If you want to find out about R.C. 4507.30 and 2305.46, just hand a fake ID to the barkeep, bouncer or cop. And don’t think it’s just a simple underage drinking case. Most prosecutors and courts frown on fake IDs. So add a fake ID to an underage drinking case, and things get a lot more serious. Think probation, jail, criminal record. All bad for aspiring young scholars about to enter the professional workforce. Grad schools don’t like such things either. Maybe that night at the bar with your old pals isn’t worth it after all. In sum, have a great holiday season. Be safe. Be happy. And be smart. If you want to be extra smart, put our number in your phone now: 614-224-9141. Or, schedule a consultation here.